The Expert Program is a little more complicated than the Basic and Advance program. It still has the same ‘Communication Settings’, ‘Pump Status’, and ‘Commands’ areas described above. The ‘Multi-Steps’ area is different. 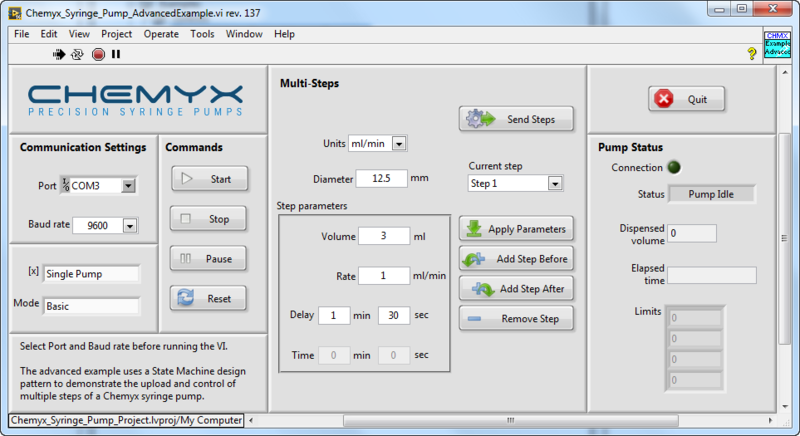 The options include single pump, pump channel 1, pump channel 2, and cycle mode. Select single pump if the syringe pump you are using is not a dual syringe pump. Choose pump channel 1 or 2 to communicate with that respective syringe. Cycle mode will cycle between the two pumps. Mode sets the mode for the syringe pump. The options in this enum are blank, basic and programmable. Select blank if the syringe pump is not a dual syringe pump. Select basic or programmable to send commands with those modes for the Fusion 4000. Units allows you to change the units used in the commands and responses. Diameter sets the inner diameter of the syringe.